Q is a big Nemo fan, it was the first movie he sat through to watch from start to finish and since our first screening, we must have watched the show over 20 times. Possibly more given he is actually able to recite lines along with the show. Anyway, the show has a quite famous scene of Nemo’s dad, Marlin and his friend Dory trying to navigate their way through a mass of jellyfish by jumping on the top of each jellyfish. Q thinks its hilarious and mimics the scene, complete with *boing* *boing* sound effects. After a particularly spirited re-enactedment of the *boing boing* scene, we embarked on our J is for jellyfish (and jaguar) craft work. I’ll be honest and admit the jaguar craft was tougher than I imagined and I ended up having to re-cut my jaguar several times cos the original one kinda looked like the Frosties Tiger with warped stripes. Q is well familiar with the Jaguar cos we see one at the zoo often enough. We ended our week with a round of jelly making. What is learning if you don’t learnt involve food somehow, eh? J is for jaguar, jelly, jellyfish, jam and jumprope! 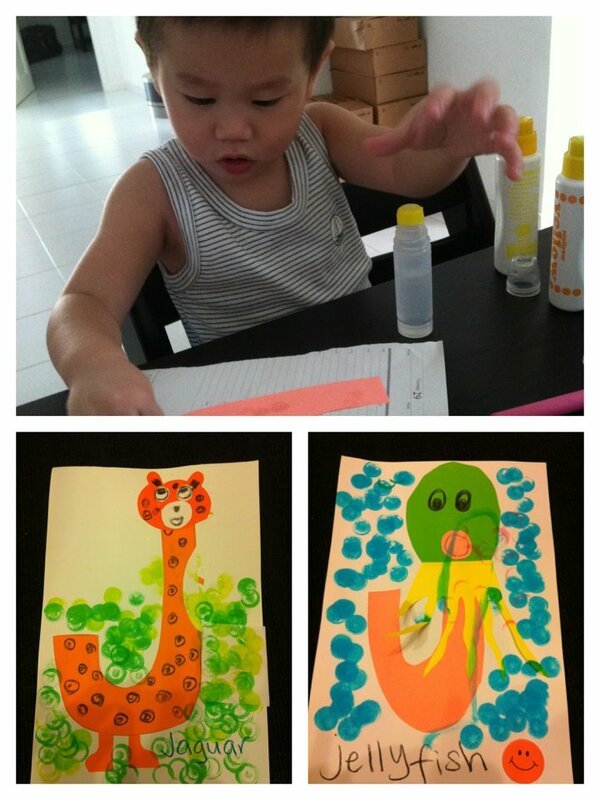 This entry was posted in alphabets, education, Learning Crafts, Letter of the week and tagged alphabet, crafts, education, learning, movie, Nemo, zoo by matchingsocks. Bookmark the permalink.